Everything and everything I do in this culture, ngiyazama. I am trying new things and making an effort, but usually don’t do them well. But effort is what counts, right?! 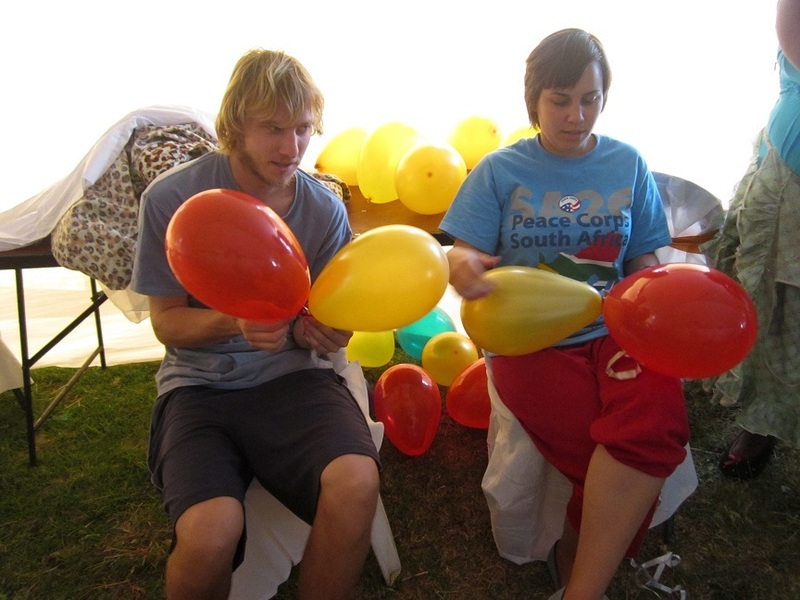 Last week at my mom’s wedding, my host sister gave the Americans the easiest possible job ever: blowing up balloons (when in doubt, give the American the easy job). My friend Michael and I epically failed at it. Balloons were popping all over the place, none of them were the same size and we couldn’t tie them. Of course we were sitting there laughing just saying, “Siyazama!” while my host sister laughed. The gogos that were also helping decorate the tent were shaking their heads. We could hear them in Zulu saying, “Ah, they are playing!” But really – we weren’t! Siyazamile! A few days later at school, my counterpart Miss Molefe called me into the kitchen to help cook for a school governing board meeting. ALL South Africans who know me well know I cannot cook – or even chop vegetables for that matter. They’re determined to whip me into shape. I’ll always offer extra hands when needed, but I’m not sure if it ever makes much of a difference. I chopped up and skinned butternut one-by-one for the meeting. My counterpart schooled me and did it all with her hands and not on a chopping board. She tried to teach me how to skin the butternut with my hands and a knife, but I’m too clumsy. I swear, if something happens to me here it’ll be because I chopped vegetables wrong and stabbed myself. So, once again, Miss Molefe gave me – the helpless American — the easiest job: stirring pap. To cook pap, a maize meal dish, you add maize meal to boiling water, let it sit, add more, then stir occasionally. Miss Molefe added all the measurements and told me what to do. All I did was stir, stir and stir. Then we served the food to everyone at the meeting. All the teachers who were in the meeting after came up to me and said, “Lizzie! Your pap was delicious! Ah, Lizzie! You can make pap!” Same response, while referencing that Miss Molefe did all the work: Ngizamile. They always try to make me feel better about about how pathetically I play the “woman” role. For those of you that know me in person, I know you can picture all of this playing out. From now until the end of service, I will continue to try. That’s all I can do. Try.